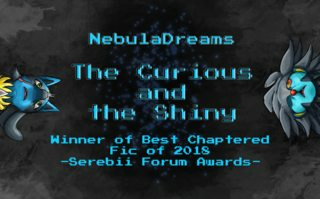 Discussion in 'Fan Fiction' started by NebulaDreams, Jan 21, 2019. Hello, dear readers! Sorry for the delay after initially deleting this thread. I got a review on FFN that was pretty eye opening to the story's faults, so I felt I had to revise that in order to suit their comments. In any case, for those not in the know, this is a prequel to my Smeargle fic Black Paint. This story details the life of Sal's mentor figure, Santiago D'Errant, and this was written to give more perspective to what happened before the events of that fic and give the characters a break before everything inevitably ends up going to hell for them. Summary: Santiago D'Errant is past his prime as a painter, and in his desperation to leave a legacy behind before his death, he takes on a Smeargle as a protege, who ends up exceeding his expectations. However, when his nephew Harvey pays him a visit and wants to follow in his footsteps, only one of the two will end up inheriting his skills. Content Warning: Virtually nothing objectionable here, folks, although there is mild swearing. Santiago warmed his old bones by the fireplace of his cluttered studio. After a long day’s work of painting and exhibiting with little success, he needed the rest. Although he was content in his retirement to continue painting, outside of a light pension, he made little money from his efforts, which meant it only covered the basic rent and not the utilities. Still, he had almost everything he needed, even if others didn’t envy his position. Almost. The hardest part was the loneliness. Not only with the lack of customers, day in day out, with no network aside from a handful of acquaintances. Even more than that, though, there was no one to continue his legacy. That was another side effect of being a hermit, he supposed. Deep down, he wished to confide in a lifelong companion, or even a Pokemon to distract him from his duties, or he was certain he would die alone and be buried along with his name. Someone knocked at the window in his studio. Propping himself up with his cane, Santiago shuffled out of his seat to see who it was. His friend, Castel, held a bundle, and gestured the old man to unlock the back door. Once he opened it, his friend stood by the entrance with his Flareon Mitsky by his feet, and caught his breath, fanning at his head with a hat. Santiago nodded and stepped back, allowing Castel to pop his mud covered boots off onto the welcome mat. And so, he brought over two hot mugs, plus one flat bowl for the Flareon, and set them on the table, with the old man and the Trainer-Pokemon team facing opposite. Years ago, he would’ve scoffed at the idea of a Pokemon speaking his language, but as he learned through Mitsky and her trainer’s willingness to teach her, the world was full of surprises. Castel placed the wrapped object in the middle of the table and unravelled the blanket to reveal a large egg. Santiago’s eyes widened at the sight of it. “Preach.” She flashed a smug grin. “A joke.” She stuck her tongue out. Santiago glanced back at his studio. The place was a good environment for a Pokemon to learn, he supposed, as it was messy with all sorts of paint splatters and equipment everywhere, but organised so one could've easily navigated it. By the walls, his works lay in piles, with finished pieces and studies collecting dust and getting damper over time. That served as a summary of his life, he supposed: a deteriorating shell of what he once was, waiting for someone to pull him out of the shadows. He looked back at the egg, and placed his wrinkled hand on it. It throbbed inside, as if the Smeargle was already kicking, but undecided on when it wanted to come out. The idea of taking it on as his apprentice still seemed ridiculous, but what other option did he have at that point? The only alternative was to continue painting himself into a corner of obscurity until he’d eventually waste away. Any effort to preserve his legacy was better than none. Sighing, Santiago looked to his friend once more and retracted his arm. And so, he spent the next few days attending to the egg, looking up the basic guide to caring for Smeargle while reading some of the research papers Castel gave him. Sure enough, those studies suggested Smeargle, as well as other kinds of Pokemon selected in the experiment, were capable of learning art at a similar rate to humans. It indeed showcased that if Pokemon were given the right tools and upbringing, they could express themselves in any given medium. The language barrier might’ve been a problem, but if they could learn to understand him, and if they could learn the fundamentals like the subjects did in the study, as well as stick to a schedule that cultivated their talents, then the idea of a Pokemon apprentice became more feasible over time, if still a little strange. Perhaps not so strange that some Pokemon even had their works up in galleries, with the ‘Pokemon Outsider Art’ movement, which was also included in the study. That was thinking a bit too far ahead, but even someone years away from joining the choir invisible was allowed to dream. As Castel instructed, he brainstormed the sort of names he’d call him, but only one came to mind: Sal. Similar to Santiago, yet somewhat different, and more befitting a person than a Pokemon, and so, it stuck with him. One night, after another uneventful day of maintaining his gallery to an audience of ghosts, when he came back to the studio, the egg started to crack. As soon as his weak body carried him, he rushed to its side and watched over the emerging hatchling. It wobbled to and fro on the table, to the point it nearly rolled off the table. In time, Santiago caught it and cupped it in his hands until the top layer of the egg broke off. A little Smeargle popped their head out of their shelter to look at Santiago with curious eyes. There it was, or rather, there he was. He figured it was a he anyway. The Smeargle, fresh out of his egg, had a beret-like head with brown ears sticking out of them; their features rounded by a cream-coloured coat of fur. When Santiago saw him for the first time, the chill of the room disappeared as warm blood pumped through his body. He smiled and held out both his hands for the Smeargle to grasp at. “Hello, little fella,” he said. The Smeargle allowed himself to be petted, then grasped Santiago’s arm, climbed over to him and curled up in his lap, grumbling affectionately in the old man’s company. He, or rather Sal, seemed content to stick with him for the moment, which was proof enough that the journey to get him to follow in his footsteps would be worth it, given the two developed a close bond in time. The first month or so weren’t easy, mainly because of the mess. Smeargle had a habit of smearing paint on whatever they laid claim to, and that meant Sal covered most of the studio in all sorts of different hues, even if he was just learning to walk at that point. Santiago saw fit to cover the finished paintings beforehand, so at least they weren’t damaged. Cleaning up after him, feeding him, and making sure he got some rest, however, meant Santiago spent less time actual painting and more time taking care of the newborn Pokemon and catching his breath afterwards. His lack of cognition at first also meant the old man’s complaints fell on deaf ears. Even when he had time to paint with his radio on in the background, it wasn’t all smooth sailings. While Sal was satisfied staring curiously at the old man’s progress, there were times when his behaviour got out of hand. One such incident happened at the end of the second month while Santiago went for a tea break in the middle of a master study. He left his canvas out in the open, and forgot the presence of the Pokemon in the room, who he thought was previously asleep. When he went back to his workstation, a huge streak of blue obscured most of the painting underneath. He glared at Sal, but when the Smeargle hugged his blue-tipped tail, staring up with those large eyes of his, he bit back the urge to yell. “It’s alright for now, but in the future, please don’t paint over my works again. It’s not polite to mark someone else’s possessions. Do you understand me yet? Nod your head like this if you do, shake your head from left to right if you don’t.” To punctuate that, Santiago nodded, although he didn’t bother doing the last one as it wouldn’t have made a difference if he didn’t recognise his speech. Sal nodded back. “Were you copying me just then?” To his surprise, Sal shook his head and the old man’s jaw dropped. Sal cocked his head and pointed to the radio, where a presenter narrated some sort of drama in the background. The studies Santiago read also pointed to a Pokemon’s cognition getting better with exposure over time and experience, so it made sense Sal was able to pick up on it if he listened to enough human speech. “You’re in an atelier, or what’s called an art studio, where I get to paint all sorts of works like these. Here, I’ll show you.” Santiago uncovered one of the canvases and retrieved a study of a picturesque painting, to which, Sal gazed at with wonder. Sal nodded. Although the Pokemon seemed content with the situation, Santiago frowned, as he realised he had been cooped up in the studio all this time without getting to see any part of his natural habitat. From what he read, two months old was the period where it was important for Smeargle to socialise, after all. Since they had some sort of mutual understanding, taking Sal to see the great outdoors wasn’t an issue, plus, Santiago could’ve used an excuse to air the smelly pigments out of the room. He grabbed his cane and told Sal to climb atop his shoulders, which he did, and locked the atelier to leave for the local park. On the way there, the presence of Sal on his shoulders comforted him, like he was raising his own child rather than a random Pokemon a friend brought to him late in the night. He never considered having children of his own, and felt it was too late to elope with someone as much as he regretted not doing so. Perhaps that was the closest feeling to adopting one. It was still too early to decide whether he would stay with him for certain, though. When Santiago dropped him at the park, he watched him interact with all the different playsets and with the different Pokemon as well. Perhaps it was also important for Sal to interact with others of his own kind in order to grow. They proved him wrong when the other Pokemon started ganging up on Sal. At first, it looked like playful teasing as they nudged him, but as time went on, it progressed into punches, kicks and energy attacks being thrown his way. Sal didn’t fight back, and looked uncomfortable with the situation, but that only made him more of a target. That resulted in him curling up into a ball as the Pokemon continued to attack. A spark ignited within the old man. He whipped at the air with his cane as he dashed towards the gang, scattering them in various places. While his outburst warded away the bullies, Santiago’s old age caught up with him, bringing him to his knees. He crawled to the Smeargle’s side, who looked beaten up, but nothing too serious that he had to take him to a Pokemon centre. When Santiago held him in his arms, however, he sniffled under his embrace. Once he caught his breath, he propped himself up on his cane and held Sal all the way back to the studio, where he sulked in a corner of the room. Santiago stared on, not knowing what to say. As Sal couldn’t directly communicate, he couldn’t ask how the situation escalated, but if he had to guess, it was a classic case of alphas showing their dominance over the naive newcomer. Still, with the way he refused to fight for himself, it felt wrong to try and make him more aggressive. There was a lot he needed to learn about Sal’s nature, but if he knew one thing that personally cheered him up from a bad day, it was the joy of putting pencil to paper. And so, Santiago looked for any materials he could give the Smeargle to cope with his humiliation. Once he found what he was looking for, he knelt down to Sal’s level, holding the present behind him. He presented a pencil and sketchbook kit, making the Smeargle’s face light up. Sal squealed in gratitude before playing around with the sketchbook. At first, the Smeargle struggled to grasp the pencil correctly with his three paw fingers. Seeing his predicament, Santiago demonstrated with a pencil of his own and suggested several ways for the Pokemon to use his tool. After a few attempts, Sal settled for holding it with his thumb at the top and the two other fingers holding the bottom, and from there, tried experimenting with the different lines and textures one could make with a pencil. They weren’t exactly intelligible, and the lines were shaky at best, but it was a start. Sal’s face had brightened up since the attack, and that was enough for Santiago for now. That way, he could continue his studies without a guilty conscience. Once he set his equipment to one side, turning in for the night, he noticed the Smeargle hadn't budged from his seat. Before retiring to his bed, Santiago wandered to his side to observe what he had drawn. The pages he filled were nothing but lines and squiggles, but by looking at his work in sequence, he sensed he got a better grasp of drawing with his paws. There was slight improvement already. Sal nodded, and to that, Santiago smiled. Sal didn’t pay any attention as he kept doodling. He took the action as a sort of understanding, so that was enough for him. The next morning, Santiago checked out the back room. Sal had fallen asleep, pencils scattered on the floor with the sketchbook splayed out. He crouched down to examine the pages, and as expected, they still consisted of nothing but lines. However, they had turned from wobbly lines to confident strokes since he last saw them, which showed immense improvement if he had done this freehand. Or freepaw, as it were. He put the pad back where it laid, and drew open the curtains, letting light into the room as dust particles floated in the air. As sunlight hit Sal’s face, he awoke once more, and groggily reached for his sketchbook, continuing to draw. Before Santiago opened up shop, he prepared what he considered a fancy breakfast for him and Sal: a plate of eggs on toast for them to share, with tea in different cups. That was all he could afford daily, but he guessed it was a novelty to the Pokemon, who had to make do with Pokebiscuits and water for the first two months since his birth. He called him over, and Sal stood up, staring at his master. In two months, he had grown somewhat, looking akin to a small child rather than a baby. Sal nodded and sat on the seat opposite him. He dug into the toast with glee, smooshing yolk on his face in the process. Sal nodded with even more vigour. “Then it’ll be easier for you to adapt.” Santiago gulped the rest of his breakfast and washed it down with some herbal tea, which cleared his mind. He briefly thought back to when he first started out, as a ten year old, on his first day in the private academy in Saffron. The first assignments went over the basic forms: from squares to boxes, then circles to spheres to cylinders. That’s where any artist started out with the fundamentals. Still life would've been a good place to discipline the Smeargle first. If that failed, and he couldn’t progress further from there, then maybe Santiago would look somewhere else for his apprentice. Sal took his word, looking delighted at just smelling the scent. Aside from gallery maintenance, Santiago spent the day converting the atelier into a study area while Sal drew at his leisure. With the old man’s slow gait, it took hours for him to prepare, but by closing time, it had transformed from a squalid storage space into a workshop with easels stationed and drafting equipment at the ready for them to practise side by side. The next day, Santiago prepared the first still life composition, starting with leftover cardboard boxes and tennis balls for the two to draw. The first results from Sal were as expected from a beginner artist. Although he was instructed to sketch and not paint at that point yet, as pigment mixing was another thing entirely, none of the perspectives of the objects matched each other. They were drawn with steady lines and clear form, which showed the Smeargle grasped what he saw, but it still needed a lot of work. Santiago sighed. He dreaded telling any student about their mistakes, much less a Pokemon. How would a Smeargle react when met with criticism? Would they get discouraged, or would they trash the studio in a fit? Only one way to find out. Sal nodded, looking his chipper self. That went down better than he expected. And so did the second and third time, when Sal applied his teacher’s knowledge and tried his paw at drawing the same thing again and again, with minor improvements to the forms with each iteration. He started imitating Santiago as well by holding out the pencil in front of him as if he were measuring it. Over a continuous week of studies, Sal’s still lifes had improved immensely when it came to accuracy, and hadn’t complained once; miles ahead of a lot of his former students that let their ego get the better of them. If he learned the basics of perspective and form in that time-frame, then he could’ve applied it to anything he wanted. As a reward for the end of that week, Santiago draped thick rolls of canvas over the room and let Sal splatter the room with paint, just to get it out of his system. The whiff of pigment still lingered days after, but by the end, he had created a wide tapestry of abstract art which he displayed in his bedroom. Before Santiago knew it, weeks turned into months. Every time Sal improved in one of his study areas: perspective, light, anatomy, form, composition, even if it was a slight improvement, he made sure to reward him for his efforts at the end of the week. Even a small gesture such as baking a cake became special between them. Although he had to support himself with a cane to be able to walk long distances, he occasionally took Sal on trips to do plein air studies, life drawing classes at the local club, or street sketches of the various people in the plaza. With each outing and each weekly spoil, the two developed a closer bond. The days of isolation for Santiago had long since passed, where not even the lack of customers on most days bothered him. Before he knew it as well, two years had passed, and between then, Santiago and Sal turned master and student respectively. The Smeargle had successfully transitioned from sketch artist to budding painter, regularly producing portraits, landscapes and studies of gradual quality, though he had yet to develop his unique style. Still, he was talented than most around his experience level, perhaps even better than the Smeargle he read about in the study. He’d have considered him a prodigy if there was such a benchmark for a Pokemon. Their morning went as usual as they painted their own subjects in their respective sides of the room, and all was peaceful. That changed when the phone rang for the first time in ages. Although Sal jumped at the loud noise, after he recovered, he picked up the receiver and handed it over to Santiago. He hung up and handed the phone back to Sal, who cocked his head at the conversation they had. Sal smiled at the suggestion. It would’ve been good for him to interact with someone younger and up to date with the times, rather than a fossil like himself. They got back to their study for a moment, and a few hours later, Harvey entered the studio, having grown since they last met, but had gotten scruffier too if the greasy black hair and unironed clothing was of any indication. “Hey, it’s good to see you again, gramps,” he said. “I dunno, I haven’t spoke to them in a while, but I think they’re fine.” He smiled, although his crossed arms betrayed his tone. Santiago hadn’t seen his brother since they both graduated from the Saffron School of Visual Arts. While they initially kept in contact over the phone as they travelled through their respective walks in life, without warning, the calls stopped altogether. Harvey was the only mediator between the two brothers, but even he had little to report. Thankfully, the atmosphere changed when Harvey looked at Sal, who squeaked and hid behind Santiago’s legs. He was taken aback by that question. Harvey hadn’t shown any previous interest in art, even in the occasional phone calls they had, and since then, Sal had proven himself as a more than promising student. What more would he have to teach that he hadn’t taught the Smeargle? “Oh yeah, I wouldn’t have come empty handed after all!” He fished inside his spacious bag until he drew out a sketchbook, which Santiago flipped through. While Sal looked at each page with delight, Santiago couldn’t feel the same way towards his nephew’s art. They were cartoony, which he didn’t mind on principle, but more than that, they lacked polish, as the sketches had many anatomical issues and stylistic inconsistencies within the drawings of the characters featured. It was as if he copied designs off of the Pokemon show and tried to base his own style on that. If Santiago was being honest, he wasn’t sure he was cut out to follow in his footsteps like Sal did. Yet, it was unfair to compare his work to that of someone who possessed natural talent, despite the differences in species. Talented or not, the backbone to any good artist’s oeuvre was a solid work ethic, and given enough time and discipline to practise, anyone could’ve made gold from their bronze. Harvey made his own way up to his new room to unpack, and the rest of the day flew by. They discussed a schedule both Sal and Harvey would be comfortable sticking to. In return, Harvey would help with the cooking and anything else that needed maintenance. Having a trainer there who was more spry than he was made the work a little less taxing, after all. In the meantime, Harvey brought his two Pokemon out, a Chikorita and a Machop, who looked at Sal curiously as he drew in his corner. Santiago observed Sal’s behaviour, and although he was shy at first, ignoring them as they watched, once they started conversing, he stopped his work and started chatting with them. The Chikorita drew out the vines and shook his paw, which he smiled at, and by extension, Santiago smiled too. It was nice to see him getting along with other Pokemon after that last incident. Perhaps it would’ve been nice for him to have a playmate if Harvey’s stay wasn’t permanent. But if that wasn’t the case, then who would take care of Sal after he was gone? A crafty Lucario, a bookworm Luxray, and a dark secret waiting to be unearthed. A Smeargle's desire to paint versus forces much greater than him. Hoy! I see here you have an origin-story prequel going! It's just started so I don't have too much to say but this is very, very cute. Baby Smeargle! I see where you're going with this whole rivalry thing and right now I'm rooting for Sal even if Harvey is the more relatable artist but I hope something is worked out by the end. I will say I'm doing an art class right now and many of the lessons Sal is going through are familiar. I'm wondering, is Sal's ability to learn Sketch going to come up when he interacts with other Pokemon? I know his first instinct is to... not fight, but. But yeah, this is cute and I hope to see where it goes. Thanks, @Umbramatic! I didn't know that about you, actually. I hope that's going well for you! And wow, this part was long overdue! I intended to release it a week after the first part since I wrote both parts at the same time, but a lot of stuff happened in between, and I needed to write new scenes on it to expand on the character development, so I really let it fall by the wayside for a significant amount of time. I sat down though and managed to do it at least, so here's the second and last part of Blank Slate! The rest of the night passed with ease. The morning after, Sal and Harvey were instructed to draw the still life in front of them. It consisted of a few berries, clear pitchers of water, and pieces of cloth draped over a table with the backlight of the studio windows shining onto it. The two worked side by side while the other Pokemon in Harvey's team slept. Their tutor occasionally peered in to check their progress. Once Santiago declared both their works finished, he stared at the canvases of the two. Sal’s painting on the left was a faithful recreation of the scene before him, as the objects looked exactly as they appeared in the composition with enhanced colours, making it look like heightened reality. Harvey’s drawing on the right, however, looked off, since the angles seen in the drawing didn’t match what was actually there. He had a feeling it would come to that, which was why he requested Harvey to not go any further than the sketching stage, much like Sal did when he started out. Santiago took Harvey’s pencil and held it out in front of his nephew’s line of sight to go over the outlines of the objects. “But that takes time!” He raised his voice. The Smeargle shrugged and turned away, looking embarrassed. For the rest of the night, Sal chatted with the two other Pokemon and showed them his finished sketchbooks, which they gazed at with delight. Santiago and Harvey watched whilst they ate a serving of canned Magikarp and rice; the best Harvey could’ve done on a limited budget, but was acceptable nonetheless. Even if the food was bland, he appreciated the effort, and it was nice to see Sal take pride in his work. “They’re getting on well with each other,” Santiago said. Harvey stirred at his bowl, mixing the rice and fish together into one pink heap of slop. Harvey’s cheerful mask slipped, and he frowned. He must’ve hit a sore point by bringing that up. The last time he spoke to his brother about his own journey, he seemed dismissive about it, and so concluded it wasn’t supporting his needs. Still, wouldn’t he have wanted to support his own child if he showed interest in it? Santiago backed away and put his half-empty bowl down, wiping the grains from his face. Without hesitation, Harvey transferred the contents of Santiago’s leftovers into his own and chewed noisily as they watched the Pokemon play with each other. It distracted him from the heaviness of the conversation, and his worries about his nephew lifted as he watched the Chikorita juggle Sal and the Machop with those vines of hers. Sal chuckled as she bounced him up and down in the air. It was surprising to see him that expressive. Even more so when Sal sprouted vines of his own and accidentally whipped the Chikorita in the face. The air cracked around it, and the Chikorita flinched, blood trickling down her nose. Santiago’s eyes widened, while Harvey rose form his seat, stomping towards Sal. “What the hell do you think you’re doing!” His voice boomed in the studio space. The Smeargle squealed and scurried to the corner of the room, cowering beneath an overturned duvet. Harvey covered his mouth, realising what he’d done. He took a deep breath and relaxed his shoulders. Santiago grumbled and wearily got to his feet. He shuffled over to the Chikorita, who had recovered from the incident. While the attack must’ve popped a blood vessel, she was otherwise unharmed. However, that was enough for her to be swarmed by her teammates, with Harvey kneeling down to her side and Machop hugging her. She nodded and looked over to the duvet pile. The Smeargle hadn’t come out yet. Santiago stared on, trying to gauge Mari’s reaction. He hoped this wouldn’t cause friction between Harvey and his team, especially since they only came in recently. Instead, Mari calmly retracted one of her vine’s and uncovered the sheets. Sal had curled up in a ball. She tapped his back. Slowly, he emerged, but as soon as he caught sight of the Pokemon he had injured, he backed into the wall, whimpering. Mari smiled and patted his head with one of the grassy tendrils. Once he recovered, he placed his paw on the vine, and out came another vine of his own, except much more controlled. A pause, and then a nod from Sal. He reluctantly returned to the group and said something in his own tongue to Mari, which sounded like an apology. Mari nodded and nuzzled his cheek. The Machop crossed his arms, leering at the two. The Machop, Roy, turned his head dismissively. Santiago exhaled, relieved that the situation pretty much resolved itself. The next evening, Harvey helped stow away all the equipment the three would need for the life drawing session, and pushed Santiago through the lamplit streets of Cherrygrove on his wheelchair, with Sal curled up on the old man’s lap. Together, they made their way to the club, and waited as each attendee entered. Most of them were regulars and were already used to the prospect of a Pokemon drawing amongst the likes of them. However, one man in his late 40s was a newcomer, and when he entered, he sneered at the sight of them. He grimaced, but ultimately hung his head down and went to the other side of the room away from the trio. Harvey still looked vindictive, but he took a deep breath and nodded, setting up his own equipment. He nodded and popped the hard sweet into his mouth, putting the event behind him. Santiago wrapped his arms around both of his students. It was clear Sal needed support from him, and that Harvey needed to forget about his faux pas, so he embraced them for a bit to let them know they had his back, and continued the session as normal. Despite Harvey’s reluctance to draw a live model beforehand, he worked quickly and didn’t show any embarrassment. Some of Santiago’s teachings transferred over to him as he measured his live model like he would have with the still life, which resulted in slightly more accurate measurements. When it came to the whole of the drawing, however, it still had glaring faults, as the proportions were more stretched out than they should’ve been, and the pose looked stiff and lifeless in comparison to his subject. Sal had no such difficulties. After the session ended, on the way home, while Sal gladly took his work with him in a paper bundle, Harvey dumped his in the recycling bin. The next few days flew by with more studies. While Sal’s progress went swimmingly, Harvey looked more and more strained with each attempt he made. Santiago only commented on his faults and didn’t mention the positives, although there were slight improvements with each iteration. The boy should’ve adapted from his mistakes rather than be given false hope from compliments, after all. Perhaps a little reward would’ve lightened the mood at the end of the week. Reward or not, the consecutive days of training all came to a head when it approached the weekend, and Santiago offered to take the two out to do a plein air study. The weather seemed good enough for the location, after all. They set up their easels in one of Cherrygrove’s many groves, where the flying types chirped, the sun cast rays of light onto the clearing with only a few clouds in sight, and flowers of all shapes and colours bloomed in the springtime atmosphere. It was a scene lifted from a picturesque pastoral painting; the perfect subject for a study of that nature. While Sal worked with oils, Harvey worked with watercolours, although he was rather inexperienced. While the processes were different, Santiago was able to check both of their works in progress. The goal was to work with colour as well as perspective and composition in order to apply what they learned through the still life studies. While the session passed with ease for the most part, halfway through, more clouds emerged, which meant the two had to change the skyline to adapt to the new lighting. While Sal was able to shift his paints with ease, Harvey had to start from scratch on a fresh page, much to his chagrin. It was hard to paint over watercolour, after all. As Harvey sketched anew, he grew increasingly irritable, muttering to himself and making thicker marks on the page with his charcoal. Santiago sensed something was wrong, and so, he patted Harvey on the back, only to be met with a stone-like glare. By reading between the lines, Santiago sensed this wasn’t about the workload, but something more personal. Sal looked back and forth between the two, sinking further into his seat. Santiago watched as his nephew stormed off. He tried to chase after him, as far as his stiff bones and aching legs could’ve carried him, but he slipped, dropping his cane, and tumbled onto the ground below. The grass was soft, but the mud was hard, scuffing his wrinkled skin. A few drops plopped on his head, then thunder crackled, and the downpour pelted his entire body, soaking through his clothes. He hadn’t thought to bring a jacket, but more pressing issues were at hand. He turned to the remaining easel, only to find Sal was missing. His heart pumped faster than it had in ages. Where had he gone? Did he storm off too after Harvey’s tantrum? Was he still safe in the reserve, or had he wandered off somewhere dangerous? “Sal!” he shouted, trying to get his attention. “Sal! Harvey! Answer me!” The shower continued, indifferent to his cries. The cold seeped into his skin and down to the bone, making him shiver. He was alone in the great outdoors. It occurred to him he was unprepared for the sudden torrent, and that, mixed with his old age, would’ve proven fatal if he didn’t find shelter in time. His studio wasn’t too far, but the difficulty was walking all the way over there unassisted in the first place. He reached for his cane, shambled to his feet, and walked as fast as his weakened state allowed, ignoring Sal's unfinished painting. For anyone else, it would’ve taken five minutes to get there by walking distance, but with his weary feet and clumsy gait, it took him twenty. That was enough time to catch more than just a cold. One step at a time, he advanced through the endlessly stretching pavement. His breaths grew more pained as he walked, and his blood turned to ice. Where was everyone? Why had it happened so soon? Why couldn’t at least one of them stayed to get some help? Once the burden became too much, he fell to his knees, clutching his cane in a death grip. If he tumbled once more, he would’ve surely been out cold and left to wither away. His vision started to blur, either by the mist from the rain or by exhaustion. Someone picked him up by his shoulders and he felt weightless again. Who was it? Who came to help him, if they weren’t some thug? They guided him to the back to his studio in a matter of minutes, where they laid him on the couch close to the fireplace. Santiago tried to regain focus on the scene, and slipped in and out of consciousness, but somehow, the air around him felt warmer. Although he could barely move, his eyesight returned to normal, and saw Castel and Mitsky tending to his side. Castel gripped his wrinkled hand and guided it to his chest, smiling. If he died there, Santiago probably would’ve been happy, being in the company of one of his only friends, but he knew there were still loose ends left untied. Although he could barely move his arms, he still had enough control over his wrists. Santiago held onto the Flareon’s pouch and the iciness in his body melted away. It felt like one of those hot water bottles. He mustered the energy to sit up and observe the rest of the room, but when he came to his senses, Sal’s side of the studio lay in ruins. Scraps of torn up drawings laid scattered everywhere, boxes of stationary had overturned and splatters of paint adorned the walls, resulting in a jumbled mess. Sal must’ve come back. But where was he? No response. At least, not until Mitsky’s ears perked up. “I hear him upstairs.” She padded over to the gallery side, then advanced up the staircase until the pitter patters of her paws became silent. In between this silence, Santiago glanced at Castel, who cocked his head inquisitively. He wanted to say more, specifically, words meant for Harvey, but stopped. Perhaps he had been too hard on the boy, or expected too much of him at one time. Perhaps Sal’s status as a prodigy, spoiled him, and heaped that ego onto his nephew. None of it was Sal’s fault, though. He nodded, and relaxed into the cushions. Eventually, two sets of paws tapped the stairs. First, Mitsky emerged, looking to someone else on the other side of the partition. Finally, Sal stepped in, paws behind his back, looking to his side. The Flareon winked at Santiago, hinting at him to say something. He stared down at his feet and said nothing. At first, Santiago wasn’t sure how to follow that up, then remembered the Flareon's talent. Sal took a few steps forward, standing a few paces from Santiago; not too close that he seemed clingy, but not too distant that he seemed cold. He spoke in growls and cries, and then, Mitsky spoke on his behalf. Sal shook his head, his eyes moist, and spoke more. That familiar chill washed over his bones again. Of course, how couldn’t he have realised this? Anyone who grew up in such an isolated environment would’ve felt alienated, especially a Pokemon. Santiago covered his face, trying to hold back his tears. Sal bawled and threw himself into Santiago’s embrace. The old man cradled him and let the Smeargle cry into his chest for as long as he needed to. While he felt like doing the same, he had to maintain his composure and be the bigger man in that situation. Sal depended on his guidance, as did Harvey, if there was a chance he came back to continue his studies. And so, Santiago rubbed his eyes and stood the Smeargle on his lap. He waited until Sal’s tears had dried, and put his hands on his shoulders. Sal rubbed his eyes and nodded. From there, he curled up into a ball on Santiago’s lap and rested for the moment. The poor thing must’ve tired himself out from all that stress. It was pitiable, yet comforting in its own way, like the first moments he spent with him as a baby, all bunched up close to him like that. He smiled to the onlooking duo. They gathered the mugs to pour the water in, and in the middle of it, the bell from the gallery doors rang. Harvey stepped into the studio, bringing both easels back: the one that he took with him, and the other Sal left in the rain. The painting was intact, as the oil held its form and didn’t run easily even in wet conditions. Once he stood them up, he sat on a chair and gazed at Santiago with tired eyes. He opened his mouth to ask Harvey to apologise, but decided against it, as he didn’t want to press him more than necessary. Harvey crossed his arms and spoke of his own accord. Santiago laughed and shook his head. “This is going nowhere, my boy. I don’t want to drag this on any longer, so let's say we were both at fault and put this behind us?” He outstretched his hand and Harvey shook it in return, and so did Sal. Altogether, their past worries evaporated into the air. For the most part. Hours passed, and everyone settled down for the night. Harvey and his team slept upstairs, with Sal downstairs. Castel bundled himself in a sleeping bag to make sure Santiago didn't suddenly fall ill. The event, however, stewed in the old man’s mind as he sat in his chair, still awake. Even a sudden downpour was enough to drive him close to death. If he had been even further away from his home, who knows what would’ve happened? Sal would’ve been left alone, without anyone to take care of him or properly adjust to the outside world. And then what? Would all his practise have been for nothing? What about his dream, if he had one? Would that go unrealized too? The Smeargle dozed peacefully in his duvet pile, with Mitsky keeping him company. Santiago sighed. As much as he usually stuck to the adage of ‘let sleeping Mon lie’, he needed to speak to him. He wearily got to his feet, clutching his cane, even harder this time. The afternoon had knocked the wind out of his sails, but he could still walk. He shambled to the duo, and gently patted Mitsky’s head first. She lazily opened one eye, groaning. She grunted in approval and got to her feet. Next, he stroked Sal’s side, gently stirring him from his slumber. Sal nodded and stretched before joining Santiago on one of the couches in the gallery. A dim lamp illuminated the space, where most of his finest work lay hanging on the walls. They were mostly original pieces, yet for all his efforts, nobody expressed interest in buying them, not even while Sal was around. It became clear to Santiago that in his retirement, this was all he could hope for. But Sal was still there, and staring at him then and there with peering, longing eyes. He whispered in Mitsky’s ear, and she spoke. Santiago frowned. Perhaps he should’ve waited to load this burden onto his student, but it was too late for regrets now. He swallowed back his guilt and continued. Sal scrunched his paws into fists. His eyes were wet, as if holding back tears. Then, Sal looked up with a determined gaze. The old man chuckled. He’d never considered it before. Years ago, he might’ve thought those sorts of artists sold their souls to the Distorted One, but now, he was in no position to complain. Perhaps it would’ve made for a nice distraction from his usual studies. Sal smiled, and leaned in to hug his master. He didn’t speak that time, but he didn’t need to. Santiago embraced his student likewise, and the two held onto each other for what felt like the last time. After that, the old man dozed off peacefully in his chair. The day after, Castel and Mitsky organised a picnic, as they’d be going their separate ways from Santiago for another expedition. Harvey pitched in to prepare the food, and everyone sat in the clearing to enjoy sandwiches and biscuits to their heart’s content. The old man, his apprentice, his nephew, the Chikorata, the Machop, the hiker and his Flareon all gathered around the basket. While the Pokemon slept as they indulged in their food coma, Santiago tugged on Harvey’s shoulder and gestured them to sit somewhere else where they could talk in private. Castel was content watching over the Pokemon that dozed off, so no one was left out of the equation. It was just those two alone. Santiago took a deep breath. His hands shook. If he met his brother at that moment, he would’ve whacked him with the end of his cane. What sort of thing was that to teach his child? To never expect anything good to come from the help of others and learn to go out into the world without support? He thought about shaking his nephew by the shoulders and telling him to not give up, but that wouldn’t have achieved anything. Instead, he sighed and changed the subject. It would be difficult to talk about, as it was with Sal, but he knew that deferring it would’ve resulted in more heartache. He opened his mouth to say something to ease his nephew into the topic, then hesitated, but started anyway. “Listen. There will come a time where, for some reason or other, I wither and die of old age.” Harvey looked to his side and frowned, but it wasn’t an expression of denial, rather, a silent acceptance of the facts. “I have lived a good life, despite my struggles, and I don’t regret painting, or raising Sal, or letting you stay here. So, when that time comes, I need you to do a huge favour for me. Harvey sighed and clutched at his jeans. It was a hard cross to bear for any young relative, to pass the torch after someone close to them died. But at that point, when he was restricted to walking with a cane like that, and with his health deteriorating over time, he had to accept that the hands of Mister Death would inevitably drum his icy fingertips on his shoulders and take him away. Not at that moment, maybe. But certainly in the near future. Harvey sighed again and released his grip, wrapping his arm around Santiago’s back. I got a friend of polar nature, and it's all peace. You and I seek similar stars but can't sit at the same feast. Metal Captain, this cat is asking if I've seen his bit of lost passion. I told him: "Yeah," but only when I pedalled past him.